"Untold Story of the Bay of Pigs"
This episode of ‘friendly fire’ is one of many revelations contained in the Top Secret multi-volume, internal CIA report, “The Official History of the Bay of Pigs Operation.” Pursuant to a Freedom of Information lawsuit (FOIA) filed by the National Security Archive on the 50th anniversary of the invasion last April, the CIA has now declassified four volumes of the massive, detailed, study--over 1200 pages of comprehensive narrative and documentary appendices. In an article published today in the "Daily Beast," Kornbluh described the ongoing "FOIA wars" with the CIA to obtain the declassification of historical documents the CIA continues to keep secret. He characterized the process of pressing the CIA to release the Official History and other historically significant documents as "the bureaucratic equivalent of passing a kidney stone." The “Official History of the Bay of Pigs Operations” was written between 1974 and 1984 by Jack Pfeiffer, a member of the Agency’s staff who rose to become the CIA’s Chief Historian. After he retired in the mid 1980s, Pfeiffer attempted to obtain the declassification of Volumes 4 and 5 of his study, which contained his lengthy and harsh critiques of two previous official investigations of the Bay of Pigs: the report of the Presidential Commission led by Gen. Maxwell Taylor; and the CIA’s own Inspector General’s report written in the aftermath of the failed assault. Both the Taylor Commission and the IG report held the CIA primarily responsible for the failure of the invasion—a position Pfeiffer rejected. The CIA released only the Taylor critique, but Pfeiffer never circulated it. According to Kornbluh, Pfeiffer saw as his mission to spread the blame for the debacle of “JMATE”—the codename for the operation—beyond the CIA headquarters at Langley, VA. Kornbluh characterized the study as “not only the official history, but the official defense of the CIA’s legacy that was so badly damaged on the shores of Cuba;” and he predicted its declassification “would revive the ‘who-lost-Cuba’ blame game” that has accompanied the historical debate over the failed invasion for fifty years. Only days before the invasion, the CIA tried to entice Cuba’s top diplomat, foreign minister Raul Roa, to defect. “Our contact with Raul Roa reports that this defection attempt is still alive although Roa would make no firm commitment or promise on whether he would defect in the U.N.,” operations manager, Jacob Esterline, noted in a secret April 11, 1961 progress report on invasion planning. “Roa has requested that no further contact be made at this time.” Like the invasion itself, the Agency’s effort for a dramatic propaganda victory over Cuba was unsuccessful. “The planned defection did not come off,” concedes the Official History. In coordination with the preliminary airstrike on April 14, the CIA, with the support of the Pentagon, requested permission for a series of “large-scale sonic booms” over Havana—a psychological operations tactic the Agency had successfully employed in the overthrow of Jacobo Arbenz in Guatemala in 1954. “We were trying to create confusion, and so on,” a top-level CIA invasion planner stated. “I thought a sonic boom would be a helluva swell thing, you know. Break all the windows in downtown Havana…distract Castro.” Trying to maintain “plausible denial” of Washington’s role, the State Department rejected the request as “too obviously U.S.” The Official History records General Curtis Lemay demanding on the telephone to know “who was the sonofabitch who didn’t approve” the request. Several damaged invasion airplanes made emergency landings on the Grand Cayman Islands, and were seized by local authorities. The situation created an awkward diplomatic situation with Great Britain; details of the negotiations between the U.S. and England are redacted but the CIA did suggest making the argument that if the planes were not released, Castro would think the Caymans were being used as a launch site for the invasion and respond aggressively. Although the CIA had been admonished by both the Eisenhower and Kennedy White House to make sure that the U.S. hand did not show in the invasion, during the fighting headquarters authorized American pilots to fly planes over Cuba. Secret instructions quoted in the Official History state that Americans could pilot planes but only over the beachhead and not inland. “American crews must not fall into hands enemy,” warned the instructions. If they did “[the] U.S. will deny any knowledge.” Four American pilots and crew died when their planes were shot down over Cuba. The Official History contains private correspondence with family members of some of the pilots. While attending John F. Kennedy’s inauguration in Washington in January 1961, General Anastacio Somoza met secretly with CIA director Allen Dulles to discuss the creation of JMTIDE, the cryptonym for the airbase the CIA wanted to use in Puerto Cabezas, Nicaragua to launch the attack on Cuba. Somoza explicitly raised Nicaragua’s need for two development loans totaling $10 million. The CIA subsequently pressed the State Department to support the loans, one of which was from the World Bank. The dictator of the Dominican Republic, Rafael Trujillo, offered his country’s territory in support of the invasion. His quid pro quo was a U.S. assurance to let Trujillo “live out the rest of his days in peace.” The State Department rejected the offer; Trujillo, whose repression and corruption was radicalizing the left in the Dominican Republic, was later assassinated by CIA-backed groups. Volume III: "Evolution of CIA's Anti-Castro Policies, 1951- January 1961"
This volume provides the most detailed available account of the decision making process in the White House, CIA and State Department during the Eisenhower administration that led to the Bay of Pigs invasion. The CIA previously declassified this 300-page report in 1998, pursuant to the Kennedy Assassination Records Act; but it was not made public until 2005 when Villanova professor of political science David Barrett found it in an obscure file at the National Archives, and first posted it on his university’s website. This volume contains significant new information, and a number of major revelations, particularly regarding Vice-President Richard Nixon’s role and the CIA’s own expectations for the invasion, and on CIA assassination attempts against Fidel Castro. A small group of high-level CIA officials sought to use part of the budget of the invasion to finance a collaboration with the Mafia to assassinate Castro. In an interview with the CIA historian, former chief of the invasion task force, Jacob Esterline, said that he had been asked to provide money from the invasion budget by J.C. King, the head of the Western Hemisphere. “Esterline claimed that on one occasion as chief/w4, he refused to grant Col J.C. King, chief WH Division, a blank check when King refused to tell Jake the purpose for which the check was intended. Esterline reported that King nonetheless got a FAN number from the Office of Finance and that the money was used to pay the Mafia-types.” The Official History also notes that invasion planners discussed pursuing “Operation AMHINT to set up a program of assassination”—although few details were provided. In November 1960, Edward Lansdale, a counterinsurgency specialist in the U.S. military who later conceived of Operation Mongoose, sent the invasion task force a “MUST GO LIST” of 11 top Cuban officials, including Che Guevera, Raul Castro, Blas Roca and Carlos Raphael Rodriguez. Vice-President Nixon, who portrayed himself in his memoirs as one of the original architects of the plan to overthrow Castro, proposed to the CIA that they support “goon squads and other direct action groups” inside and outside of Cuba. The Vice President repeatedly sought to interfere in the invasion planning. Through his national security aide, Nixon demanded that William Pawley, “a big fat political cat,” as Nixon’s aide described him to the CIA, be given briefings and access to CIA officers to share ideas. Pawley pushed the CIA to support untrustworthy exiles as part of the effort to overthrow Castro. “Security already has been damaged severely,” the head of the invasion planning reported, about the communications made with one, Rubio Padilla, one of Pawley’s favorite militants. This volume, which Pfeiffer wrote in an “unclassified” form with the intention of publishing it after he left the CIA, represents his forceful rebuttal to the findings of the Presidential Commission that Kennedy appointed after the failed invasion, headed by General Maxwell Taylor. 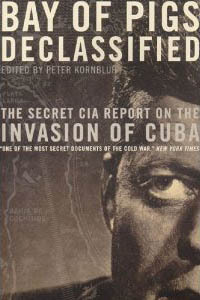 In the introduction to the 300 pages volume, Pfeiffer noted that the CIA had been given a historical “bum rap” for “a political decision that insured the military defeat of the anti-Castro forces”—a reference to President Kennedy’s decision not to provide overt air cover and invade Cuba after Castro’s forces overwhelmed the CIA-trained exile Brigade. The Taylor Commission, which included Attorney General Robert Kennedy, he implied, was biased to defend the President at the expense of the CIA. General Taylor’s “strongest tilts were toward deflecting criticism of the White House,” according to the CIA historian. After leaving the CIA in the mid 1980s, Pfeiffer filed a freedom of information act suit to obtain the declassification of this volume, and volume V, of his study, which he intended to publish as a book, defending the CIA. The CIA did eventually declassify volume IV, but withheld volume V in its entirety. Pfeiffer never published the book and this volume never really circulated publicly. Pfeiffer’s final volume contains a forceful rebuttal of Kirkpatrick’s focus on the CIA’s own culpability for the events at the Bay of Pigs. Like the rest of the Official History, the CIA historian defends the CIA against criticism from its own Inspector General and seeks to spread the “Who Lost Cuba” blame to other agencies and authorities of the U.S. government, most notably the Kennedy White House. When Pfeiffer first sought to obtain declassification of his critique, the Kirkpatrick report was still secret. The CIA was able to convince a judge that national security would be compromised by the declassification of Pfeiffer’s critique which called attention to this extremely sensitive Top Secret report. But in 1998, Peter Kornbluh and the National Security Archive used the FOIA to force the CIA to declassify the Inspector General’s report. (Kornbluh subsequently published it as a book: Bay of Pigs Declassified: The Secret CIA Report on the Invasion of Cuba.) Since the Kirkpatrick report has been declassified for over 13 years, it is unclear why the CIA continues to refuse to declassify a single word of Pfeiffer’s final volume. 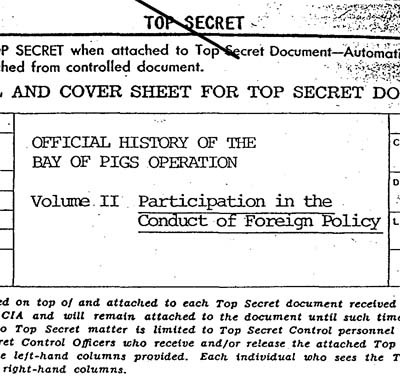 The National Security Archive remains committed to using all means of legal persuasion to obtain the complete declassification of the final volume of the Official History of the Bay of Pigs Operation.